COLORADO SPRINGS, Colo., April 25, 2018 /Christian Newswire/ -- A global prayer movement credited with playing a major part in impacting the Muslim world is marking a quarter century of activity with what is expected to be record participation. 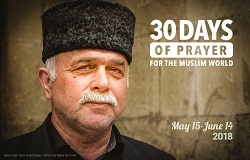 Hundreds of thousands of Christians around the world are due to take part in the 25th annual 30 Days of Prayer for the Muslim World (www.30daysprayer.com), to be held May 15-June 14 to coincide with the Islamic holy month of Ramadan. Since the initiative was launched to raise greater awareness of and involvement in Christian efforts to reach out to the world's 1.5 billion Muslims, more followers of Islam are believed to have turned to Christ than in any time in history. Organized to coincide with Ramadan as one of the high points of the Muslim calendar—a time when many Muslims seek to know God more—the 30 Days of Prayer for the Muslim World event centers on a daily prayer guide highlighting different aspects of Islam and Muslim people groups. The prayer guide is available in around 30 languages. More than 1.5 million English and Spanish copies have been distributed in North America alone over the years by Colorado Springs, Colo.-based resource center WorldChristian.com, whose director, Paul Filidis, is the North American coordinator for the prayer initiative. "While media sound bites about Islamic extremism can too easily incite anger, fear and even hatred towards Muslims, we seek to resist this temptation to generalize, and instead, resolve to respond and pray with the mind and heart of Christ," said Filidis. In this year's edition of the prayer guide, its editors note that since the initiative began there has been the rise of Islamic extremism, and "devastating natural disasters and relentless warfare in Muslim communities around the globe." Yet the same period "has also seen… the largest number of Muslim movements to Christ in history." There has been another result, they add. "We receive feedback every year from readers who have had revelations about Muslims that have widened their hearts to better understand and reflect the matchless love of Christ." Around 100,000 copies of this year's daily prayer guide—in adult and children's editions—are being distributed in the United States and Canada this year. Many churches buy copies in bulk to distribute to members, while some participants organize informal daily prayer groups with others, in person or online. Also available in digital form, the full-color 30-day prayer guide features a specific issue or area of the Muslim world for each day, helping participants gain a better understanding of Muslims and providing pointers for prayer. Copies of the 30 Days of Prayer for the Muslim World guide are available from WorldChristian.com for $3 per copy, or in bulk for distribution. WorldChristian.com is a missions-focused resource center for books, curriculum, DVDs and other materials informing Christians about important social, cultural, and religious news and trends around the world. The 30 Days of Prayer for the Muslim World focus (www.30daysprayer.com) is an international movement founded in 1993 to stir individual Christians and churches to greater awareness of, prayer for, and involvement in, the Muslim world. Available in around 30 languages and coinciding each year with the Islamic holy month of Ramadan, the annual 30 Days of Prayer for the Muslim World guide is produced and distributed in North America by www.WorldChristian.com.